Once in a while a new dock comes along with a wow factor, this one is just that. 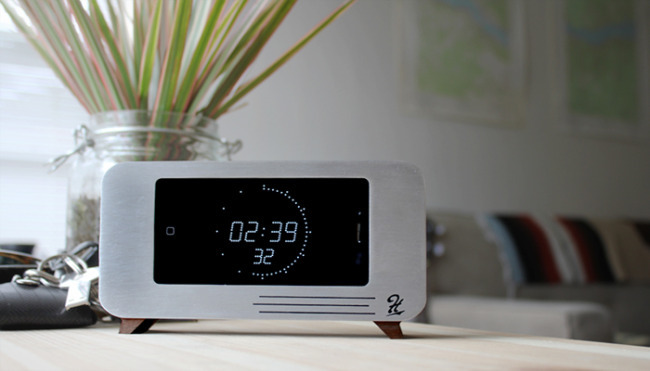 The C/Dock is an iPhone 4 dock that uses one of your clock apps on your iPhone 4 to transform into an alarm clock dock perfect for any bedside table. It's made from mixture of solid walnut wood and brushed aluminum hat creates a retro yet modern styled look. Of course the C/Dock has many other uses other than just using it as a clock dock, use it as a viewing stand or your very own music box. The C/Dock already has a built-in dock connector so that you won't need to use your own USB sync cable to charge up your iPhone 4. Just slide it in from the side to dock. It will be available in both a brushed aluminum face version as well as in a glossy black resin face version. You can pre-order yours at Kickstarter for $65 and $55, respectively.